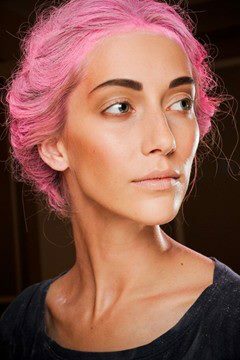 I have a particular weakness for coloured hair at the moment and given half the chance (location and facility) I'd be off before you could say powder-me-pink-darling to Bleach London and have myself transformed into something along the lines of the pink glory above. Well either that or a dip dye. Is it me or is this not totally beautiful? I found this amazing image today of Bleach London co-founder Alex Brownsell's work on a Thakoon NYC model courtesy of British Vogue.